Annual flowers can be purchased in multipacks. Some like the Wave petunias even come in hot pink plastic packs that scream to be reused. This is a guide about reusing petunia baskets. I bought my mom a basket of those Wave petunias. 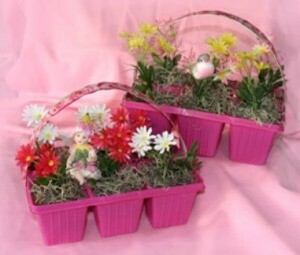 After I potted them, she said she hated to throw away that shocking pink plastic basket they came in. I got to thinking that they would make cute silk flower arrangements. You could use these to decorate tables for a bridal shower or garden club party and use them as door prizes. I also made a patriotic one with the terra cotta colored pots. You could use this for a BBQ or even a grave decoration for a veteran. Just drive a stake though the plastic to hold it down. pink "Wave" petunia baskets or other baskets annuals come in. Wash and dry the baskets. Remove the handle and cover it with coordinating ribbon. Attach ribbon with hot glue. Then attach handle to sides of basket. Cut flowers to desired height. If you will be using the baskets as table decorations outside, add a few stones to weight the baskets down. Pull off a piece of moss and wrap around flower stem. Add hot glue to the bottom of flower/moss. Place flower/moss in one section of basket. Repeat until all sections are filled. Add fairy, bird, butterfly, or flag. This craft is such a sweet idea! Imagine all the different projects you could do with these containers by just letting your imagination go crafting!!! very cute! i like the shower idea as a centerpiece in the middle of table how about water can sprinklers as a favor? ?